This is not the review-- that comes next week. Spy Monkey Creations will be releasing Spy Monkey Armory Series 1 next week, which is basically to weapons what Xevoz was to action figures. 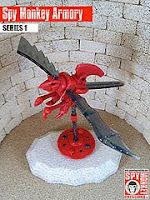 The sturdy-enough-for-collectors weapon set includes parts to make roughly 5 weapons which can split apart at several places through the increasingly popular (and soon to be ubiquitous) Glyos plugs. Pictures to the left is a Glyan trying to hold on to the Master Blade and a War Shield, both from the Doppelganger version of the weapons. They're cast in 5 different color schemes. A full review is coming next week, but I was so taken with the set I had to share early. Check out Xevoz Storm Wing holding the same weapons-- for any large-ish (let's say 5-inches or taller) figure line, these weapons are just the right size. 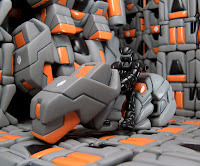 They're seemingly crafted for the likes of Masters of the Universe Classics, but there are lots of unique pegs and pieces that should be specific to Glyos customizers. In short: these go on sale next week, and for $20 I believe you'll get your money's worth... if you have a lot of action figures. If you only collect Glyos and Outer Space Men, these will be fun, but not fantastic. If you also collect other figure lines, you're in for a treat. Anyway, come back next week for more. More Glyans, Travelers, another Rig, and pretty much anything else you could want is coming and the bulk of it seems to be black and orange. So, yipee. You should go over there to read everything, but here's the price list, just so I have it handy for my own reference. "More surprises" are listed, and it's my hope there's no surprise Outer Space Men as I'd totally want to know in advance. But I gotta get a Rig Runner, definitely. "Spy Monkey Creations Inc. is proud to announce our grand re-opening and the debut of our new product line! Spy Monkey Armory Series 1 sets will go on sale for $20.00 on February 3rd , 2012 at 12pm Pacific Standard Time at www.spymonkeycreations.ecrater.com. Exciting! Several flavors will be available, too. Your pal and mine, THEGODBEAST has posted pics of his latest Armorvor, this time an insect-inspired creation. Take a look at it and his other figures so you can feel shame for your relative lack of talent! I sure do.